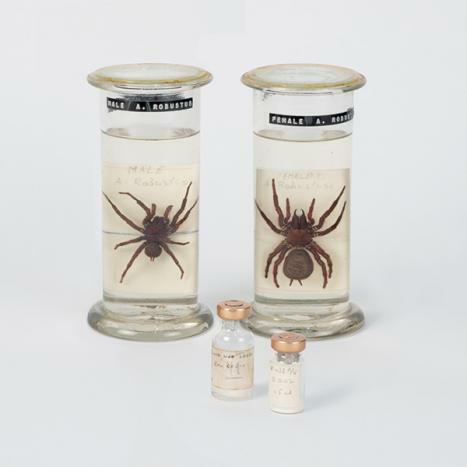 The Australian Venom Research Unit (AVRU) was founded in 1994 when Professor James Angus, then Head of the Department of Pharmacology, brought pioneering venom researcher Struan Sutherland to the University of Melbourne from Commonwealth Serum Laboratories (CSL), following the privatisation of the latter. The establishment of AVRU was facilitated by a seed grant from CSL Limited and over the first decade its work was supported by external consultancy agreements, Victorian State Government grants and contract work on funnel web spider venom. In 2001 the Federal Department of Health and Aging (DoHA) began to support AVRUs core work, and since 2011/12 this core funding has been contracted through the National Health and Medical Research Council (NHMRC). At the time of its conception, AVRU's directive was to undertake research in the fields of (1) public health, (2) clinical research and (3) venoms and antivenoms, and to continue the advisory/educational role established during Associate Professor Sutherland’s work at the Commonwealth Serum Laboratories. Within the University of Melbourne, AVRU staff quickly became active in both undergraduate and postgraduate teaching and research training. Subsequent work at AVRU has led to ground-breaking advances in our knowledge of the evolution of venom delivery systems in snakes and lizards1, the development of the 1st new snake antivenom for human use in Australasia in over 50 years2, and the translation of laboratory findings concerning the cardiovascular actions of Irukandji (Carukia barnesi) jellyfish venom into real-life emergency interventions for sting victims3. Our personnel have worked with the World Health Organisation (WHO) to develop solutions to snakebite envenoming challenges in Cambodia4, and at WHO headquarters in Geneva. AVRU also led the establishment of the Global Snakebite Initiative5 and is driving efforts to support WHO in setting up a global snakebite control programme. Our analyses of bite and sting data in Australia have led to scientific publications6 that have attracted widespread public attention, reflecting the high level of community interest in this important public health subject. Fry BG, et al. Early evolution of the venom system in lizards and snakes. Nature 2006; 439(7076): 584-88. Vargas M, et al. Preclinical evaluation of caprylic aid-fractionated IgG antivenom for the treatment of Taipan (Oxyuranus scutellatus) envenoming in Papua New Guinea. PLoS Negl Trop Dis 2011; 5(5): e1144. Winkel KD, et al. Cardiovascular actions of the venom from the Irukandji (Carukia barnesi) jellyfish: effects in human, rat and guinea-pig tissues in vitro and in pigs in vivo. Clin Exp Pharmacol Physiol 2005; 32(9): 777-88. Williams DJ, et al. Snakebite management in Cambodia: towards improved prevention, clinical treatment and rehabilitation. Report to WHO/WPRO and Cambodian Ministry of Health. 2009 Melbourne, Australia: University of Melbourne. Williams DJ, et al. The Global Snake Bite Initiative: an antidote for snake bite. Lancet 2010; 375: 89-91. Welton RE, et al. Injury trends from envenoming in Australia, 2000-2013. Intern Med J 2017; 47(2): 170-76.